Founder Lyndall Parris begins to speak in public about her dream of community living. The Sydney Coastal Ecovillage (SCEV) Incorporated Association is set up with a website to attract other interested people (being close to Sydney and the coast were key criteria). Research begins of Ecovillages worldwide. 19 November, a public launch at Greenwich welcoming 60 people. Monthly gatherings have been held since. February, The Gosford Horticultural Institute property at Narara is advertised for sale. July, First Open Day on the Narara property, held monthly thereafter. September, First presentation of ‘A Taste of Sociocracy’ aka Dynamic Governance – a governance methodology designed to encourage transparent and inclusive decision-making. December, the Global Financial Crisis (GFC) hits and our developer partner’s company goes under. Negotiations for the land abruptly end and the Narara property is taken off the market. Late 2010, after some media coverage the database passed the 500 subscriptions mark. SCEV contacts more than a hundred developers but gets very little interest. The whole property development scene had drastically changed since the GFC, with developers unable to readily access capital. SCEV makes presentations to Gosford Council, including a presentation about the proposed Ecovillage project on the Narara land. Approaches made to the local State Government members for the Central Coast electorates, familiarising them with our concepts. A permaculture assessment of the Narara site is done. We begin to organise some gatherings for our local Narara neighbours informing them of our plans. We start to consider Ecovillage bylaws. 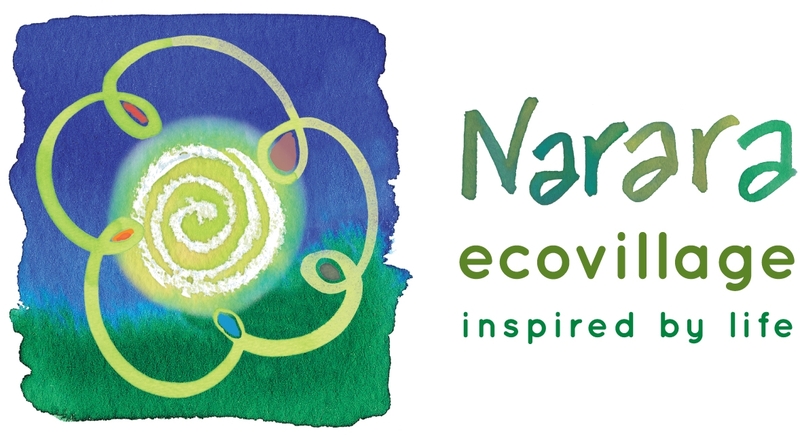 SCEV begins marketing for the Ecovillage and the Narara Ecovillage (NEV) Co-op is set up, preferring the co-op structure to the corporate structure. Late 2013, the Co-op lodges a Development Application (DA) with Gosford Council for Stage one and two clusters therein. The current Narara Ecovillage Co-op memberships passes 50 with a community of 120 people. May, the two cluster DA’s are approved by Gosford City Council with Stage 1 DA imminent. Only one cluster development is taken forward. The Sydney Coastal Ecovillage (SCEV) Inc no longer with the task of kicking off an Ecovillage (NEV Co-op is the Ecovillage developer now) is replaced with the Narara Eco Living Network Inc (NELN) and organises regular outreach events including the inaugural Ecoburbia held at Narara Valley High School, just down the road from NEV.
August, Stage 1 DA approved. We have a Board of 7 members, John Talbott, our Project Director leading our Project Development, 4 teams – Community Development, Land, Buildings and Infrastructure and Business Development. The latter is the only team not in full swing. We also have various Working Groups set up to help the teams. March: Rob Stokes, the Minister for the Environment and the Central Coast came to our site to announce that we had won a grant for $70,000 to research a ‘smart grid’ for Narara Ecovillage. May: The Member’s Annual Contribution Hours (MACH) Working Group was set up to determine how each membership might contribute their annual 52 hours of community work. Also in May, the Steering Circle Implementation Working Group was set up to introduce into our structure, the much needed interface between the Board and the Teams. This important body will facilitate the aims and domains of our teams and assist communication flow throughout the organisation. The principals of Sociocracy, our chosen system of Governance are being further implemented. June: Our total in received shares and loans from Narara Ecovillage members is approximately $15m, we are on target to self fund our amazing project. September: We held a working bee where 24 people contributed over 100 hours of their collective time. October: We held the inaugural ‘Guys bakin’ pies’ in honour of Ecovillage at Ithaca, from which we have learnt so much. November: More rigour is brought in to our membership joining process by setting up the Member’s Orientation Working Group (MOWG). We ask prospective members to fill in a Reflective Questionnaire and for them to participate in 5 ecovillage events before they complete the joining forms and pay their membership fee. After joining the NEV Co-op, the MOWG take new members through an Orientation and Welcome process. December: Lot Selection weekend is held. Here members were given two dots on which was written their Co-op Membership number, to place our first and second lot preference on a layout plan. The fun continues! Meanwhile, life continues within our community. Concerning quotes come in for our retaining walls, our water license is not moving forward easily, everything seems to take ages. We celebrate the good times, say sad farewells to members who need to leave us, watch relationships do their thing and welcome the arrival of babies, new members and families. The community is 140 people ranging in age from 8 months to mid 70’s. of the kitchen attached to the Visitors Centre. March: A number of visionary members get behind holding a lot from sale, so that we make a provision for a Common House in Stage 1. They are thinking forward to our social sustainability goals when we are 150 homes and possibly 400 people. This is upheld and endorsed at a Member’s Meeting. The Wellbeing Working Group (WWG) is established with the aim: “to champion and support various approaches and activities that are considered beneficial for the wellbeing of NEV members”. They start conversations around supporting members and dealing with conflict. April: Nine people are elected to form the inaugural Steering Circle. These people are chosen from the board and teams and ensure the important Sociocratic principle of ‘double linking’ is engaged. The Narara Ecoburbia festival receives the 2016 Gosford City Australia Day Award for Best Community Event. It was the brainchild of Joan and Richard Cassels, two of our early members. May: We are looking at ~$8m for the water, sewer, roads, and electricity infrastructure build. Stage 1 members need to sign a commitment to make Progress Payments ($100k and later $50k) on their lot so that we can manage our payments to the contractors. July: the infrastructure begins with every type of Big Rig on site. We are excited, appalled, shocked and pleased. September: Stage 1 lots are fully subscribed except for a couple of one-bedroom apartments. We receive news that we have won a $1.2m grant from the federally established Australian Renewable Energy Agency (ARENA) to establish a smart power network. The requirements are that we match the grant (57% us/43% them) and agree to publish our findings and experience. Huge milestone: our infrastructure is complete but the rate of progress towards our Subdivision Certificate, the issue of titles and the start of our house construction is painfully slow. There has been a Council amalgamation. Gosford Council and Wyong Council have become the Central Coast Council. Most of the relationships we built at Gosford Council have gone and now the senior staff are overwhelmed and overworked. We have four roads to name and the process is illuminating. It took longer than expected and we end up with a great outcome. The final names agreed are Gugandi Road, Syncarpia Crescent,Balgara Rise and Kintay Lane. With our newly revamped kitchen in the Visitors Centre, we add a monthly ‘Cook team‘ dinner to our frequent ‘Pot luck’ celebrations. A different small team of members, volunteer to cook and clean up once a month for their future neighbours. These volunteers are in service, gifting a night of relaxation and delicious food. It is sweet on both sides. Narara Ecovillage continues to attract great interest and each month many visitors come to our Village Open Days. We are now also attracting the interest of academics and change agents, interested to see what we are doing and how we are progressing with our triple bottom line aspirations. Many Working Groups are forming around the different interests of members, as well as areas where we identify gaps and opportunities. The Business team begins to take shape, concentrating on the areas of Accommodation, Food, Education and Business Support. We are keen to progress our exemplary aspiration and commercialise this for our ongoing financial sustainability. At last we receive our Subdivision Certificate from Central Coast Council. Titles are issued to members. Lots are settled and our house construction gets underway. The first homes are built and a few families are now living onsite.